Pristine pastels and sultry seascapes assure an endless summer in this two-bedroom, two-bath condo, no matter what time of year you choose to visit! The master bedroom boasts a luxurious king-sized bed and an ensuite bathroom featuring an enormous walk-in shower. The second bedroom has a queen-sized bed and is just steps away from the second full bathroom, which has a tub/shower combo. Each bedroom is outfitted with its own flat-screen TV, as is the cozy living area, with its queen-sized sleeper sofa. 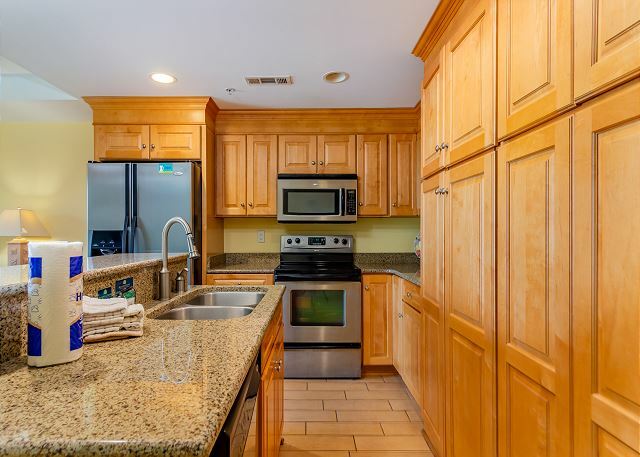 The full kitchen gleams with warm hardwood cabinets and stainless-steel appliances and has a perfect view through the living room to the floor-to-ceiling sliding glass doors leading to the private balcony. 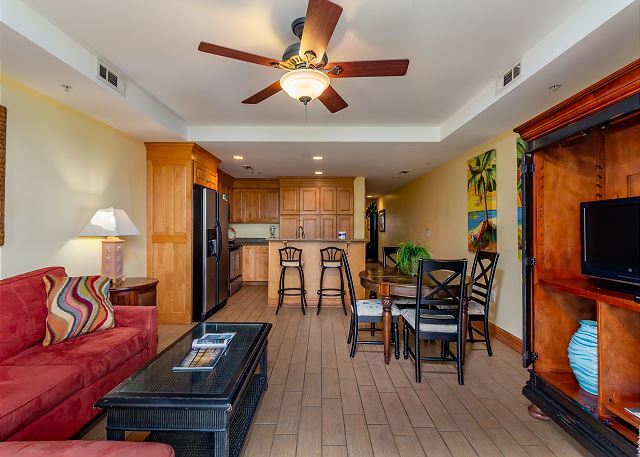 The view of the courtyard adds a touch of the tropical to the already beachy feel of the unit! unit in good shape.services not there,they don't respond to anything. multiple requests to repair tv in bedroom-no show,we ran out of toilet paper,and no services anytime,towels never replaced,also they charge for cleaning? i'm done with this place.----Beachside Colony RESORT. RESORT? what a JOKE...BYE you'll never take my money again. Check in is at 4pm. We checked in after 5pm and still housekeeping was cleaning and hand washing dishes since the dishwasher was broken. Our floors were filthy and required us to wear shoes the whole time, the tv was broken in the master, unit sleeps 6 yet there’s not enough dishes, silverware and glassware for 6. We understand the island still needs repairs from the previous hurricanes last year. However, our “beachfront resort” was not accessible during our stay. You had to walk down to 6th Street to access the beach. The construction workers swore at us and our children when we tried to walk in between the dunes and their orange fencing due to a storm quickly approaching. We have stayed at Beachside Colony in the past, we will not be returning. It wasn’t what I expected for the price we paid. TV did work, couldn’t walk around with out shoes. The floor would get your feet black. The pools were cold and low on water. The water spikets to wash sand off when coming from the beach didn’t work. Also had stains on the linens. Location was perfect, pools were perfect. Condo had some issues. Actually it was dirty, hair in tub, floor filthy, dishes in dishwasher. Some things in the condo were broken. Like the cabinet door in kitchen hanging off hinges, the decorative items, like coasters were broken, even the phone was broken! No linens for extra rooms. Really needed to be updated. We did inform management. Explanation was that it was overlooked by staff, and still recovering from hurricane. We totally could understand that, but kind of felt just a little dissatisfied with overall condition of the room, that had nothing to do with hurricane damage. We enjoyed the beach and location of condo, but not sure if we will come back. We will give them so time and see if things improve. We loved this property! We loved the staff even more! Pattie Jo, Jennifer, Susie and Shere were very helpful, as well as very professional and helped make the stay great. Property was clean, even though they are in the midst of repairs from two hurricanes. There were a few maintenance items that needed addressing, but they are trying to get everything back together. We plan to stay here again without question. My son and daughter-in-law had their wedding on the beach at the light house. 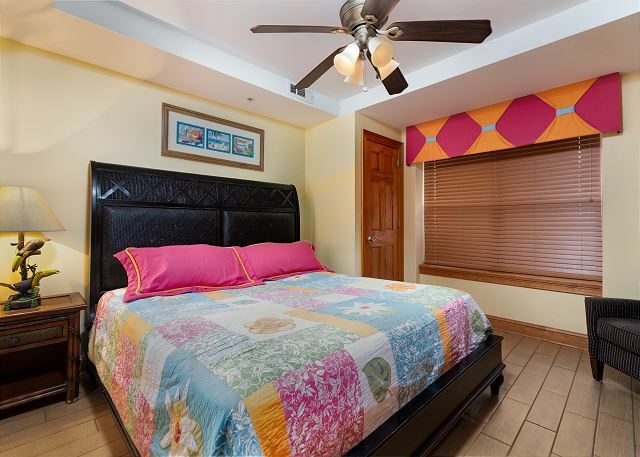 Beachside Colony was very convenient in proximity to the site and other attractions. The condo was clean and I would definitely consider staying there again. 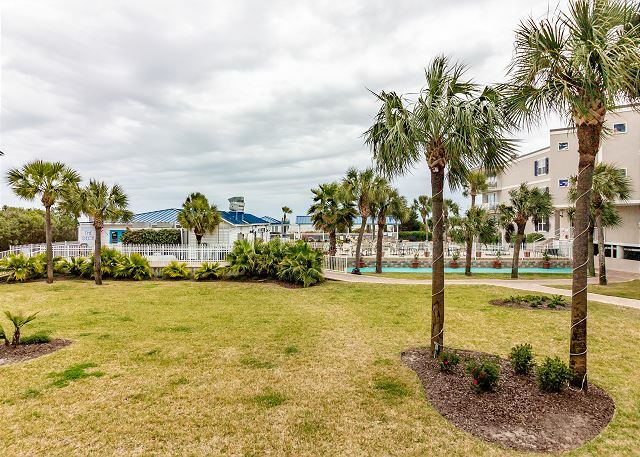 We love Tybee Island and the Beachside Colony Resort. However we were disappointed in the condo we stayed in. It needed maintenance (door stuck, shower area had mildew). The condo we stayed in last year was nicer. We've stayed 2 times at Tybee. This time with friends and it was amazing. Staff at front office were amazing. Room was well kept and clean, but a few minor things could be fixed. Our view was very nice and a quick walk beach access was perfect for kids! And, they're pet friendly!! Enjoyable overall. I think the photos are a tad misleading as to the size of the complex, but not bad overall. The pools are very small with a crowded pool deck -- but the beach is just steps away which compensates. Restaurant is convenient and was very good although the live band was a bit loud. I think we would stay at the complex again, but maybe look for a different unit that was more updated. Great location. Had a wonderful experience. Loved the location to the beach and walkability to the shops. The condo was spacious and well maintained. We enjoyed the pool area and the staff were friendly and very efficient. We would absolutely stay again! We were very pleased with Beachside Colony Resort. Very clean, We enjoyed our stay and we would recommend to anyone that goes to Tybee Island to stay with yall! fantastic! We stayed at the beach house #114. Perfect location. Pools and beach steps away. Very clean, plenty of space for our family of 4 (two teenagers). The beach is huge. Resturaunts and "downtown " within a mile. Savannah only 20 minute drive. Highly recommended. Guest services made finding our room easy and late check-in arrival a breeze. A quick walk to the pool with beach access just beyond. Not a far distance and you're in the ocean. Our condo was clean and quiet. The restaurant's poolside service was amazing and the staff was nice. The separate toddler-friendly kiddie pool with a waterfall was nice to be able to park ourselves at a table nearby and watch our kids play. We would definitely stay at this resort again. The unit was nice and clean. The only real issue was the lack of flatware. It was quite difficult to eat our morning yogurt with the one serving spoon located in the spoon drawer. After reporting this situation to management we were given a complete set of flatware . This more then satisfied our issue.The property location was easily accessible. I would be glad to recommend this rental property to anyone! My family an I had great time. Cant wait to go back. Overall, we were happy with our stay. One thing that I was unhappy about was the condo temperature was set and locked and it was very cold in the condo. We were not able to adjust the temperature at all. Maintenance was not able to help us unfortunately.